In his last novel F. Scott Fitzgerald wrote, “There are no second acts in American lives.” Not true. “Reborn” like a zombie this week, the theory of secularization is seemingly back from the dead (at least in the American popular imagination …see the image above). Social scientist Rodney Stark has lamented, “For nearly three centuries, social scientists and assorted western intellectuals have been promising the end of religion. Each generation has been confident that within another few decades, or possibly a bit longer, humans will ‘outgrow’ belief in the supernatural (“Secularization, R.I.P.” p. 249). This is a bit odd as people continue to speak of the theory “despite the fact that it never was consistent with empirical reality,” Stark notes (p. 249). Ironically, if you believe in the theory of secularization you are probably doing this mostly on faith. Great new data from Pew on global religious affiliation indicate this theory continues to be empirically challenged (my previous post explores some of the domestic implications of this study along with Gallup’s recent research on the topic). The theory of secularization assumes that human beings will become less religious over time as societies “modernize” and undergo economic development that results in important cultural changes. This evolutionary framework predicts that rising levels of education and autonomy in these societies lead people to eventually reject religion after which religious institutions become less significant and eventually wither away. If this theory is accurate we would expect to see religion to be strongest in the “developing” world and weakest in those countries that have “modernized” under capitalist and democratic systems. The problem for this theory continues to be reality. When applied to data it often does not work as neatly as it is assumed. 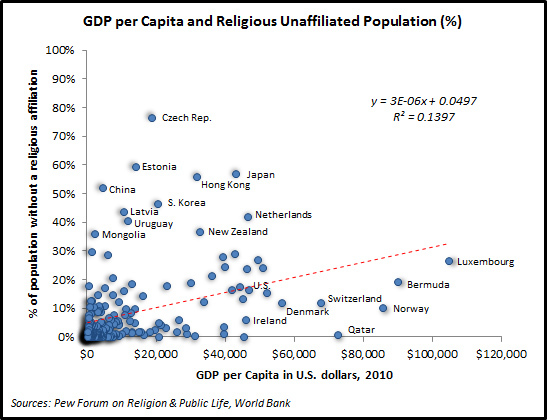 One representation of this is shown below in a scatter plot of Pew’s country-level estimates of the religiously unaffiliated by each nation’s GDP per capita. There is an upward sloping straight line through these data—just not many observations around it that would represent a powerful relationship. However, if you look closely you can see some other potentially important patterns that may deserve further exploration. Notice that most of the world’s Nones were not fostered in the bright light of “reason” blooming in “modernized” countries. Instead most have been raised in states that actively and in some cases brutally suppress religion. About 19% of the world’s population lives in China. At the same time this single country is home to 62% of the global unaffiliated. When one adds in other similar states it is evident that two-thirds of the world’s unaffiliated live under a communist regime. An additional six percent live in formerly communist countries adjacent to the former Soviet Union or China. One commenter to the Huffington Post’s story on the Pew data wrote ,“Yay! 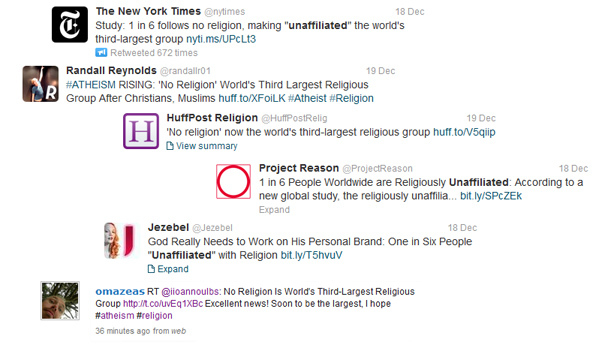 Go non-religion go! Reason is pulling ahead in the curve.” Maybe this comment was posted via an iPhone along with many other seemingly celebratory tweets about “Nones being the 3rd largest (non)affiliation in the world.” How many of these people knew that the person who assembled their phone lives in the country that is singularly responsible for that 3rd-place “title”? Remove China from the numbers and the unaffiliated fall to a distant 4th—behind Hinduism (...all of this completely ignoring that many unaffiliated consider themselves religious and believe in a creator). Of course there are other causal factors to explore than communist state repression of religion. For example, many of the countries with the largest numbers of Nones have historically had very low or immeasurable levels of affiliation with the world’s Abrahamic religions (i.e., Judaism, Christianity, or Islam). Three-fourths of the world’s unaffiliated live in such a country and all of these are in Asia. Nations that have had an Abrahamic religious tradition represent a majority of the world’s population (55%) but contribute only 25% of the world's Nones. Three-fourths of the world’s unaffiliated also reside in countries with a GDP per capita below $15,000. Yet the data may also reveal a weak pulse for secularization theory in the higher within-country unaffiliated percentages, on average, in nations with higher GDP per capita figures (i.e., last column in the table). Then again these percentages are in the teens and far below those seen in communist countries. “Modernization” is certainly not doing any of the heavy lifting in creating more of the religiously unaffiliated. Stark once proposed that, “once and for all, let us declare an end to the social scientific faith in the theory of secularization, recognizing that it was the product of wishful thinking” (p. 269). Yet I don’t think the end is near. Predicting the demise of secularization theory is just as dangerous of predicting the demise of religion. Faith remains comparatively strong in both. I know some religion reporters who seem quite a bit fonder in the former than the latter which helps the theory of secularization thrive in popular culture even as belief in God in the U.S. has fallen only 5 percentage points since 1944. The modern construction of the Mayan prediction (...no resemblance to what they believed or understood) was indeed wrong. It’s December 21st and you, me, God, and secularization theory are alive and well in America. I am just finishing a semester teaching a course on theory and evidence for secularization and preparing for next semester where I will teach a class on forecasting and prediction. The intersection of these two courses has me thinking about the future of religion in America and there is some new data out to review on the topic. 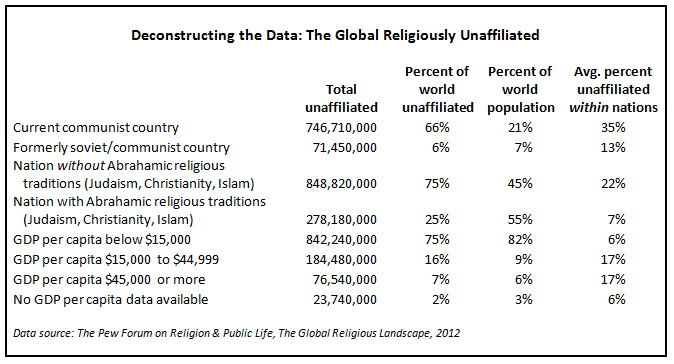 Pew just released a study on global religious affiliation and non-affiliation. Approximately 16% of people around the world do not have a religious affiliation amounting to about 1.1 billion in all. Some 50.9 million of these people reside in the United States representing 4.5% of the world’s “Nones” (...75% of global Nones live either in China, Japan, Vietnam, Korea, or Taiwan... for more on international numbers see my next post). Sixty-nine percent of American adults are very or moderately religious. Trends in the age composition of the American public suggest that religion may become increasingly important in the years to come. This is mostly the result of the fact that the number of Americans who are 65 and older will essentially double over the next 20 years, dramatically increasing the number of older Americans. As long as these aging baby boomers become more religious as they age—following the path of their elders—the average religiousness in the population will go up. That final point sure seems a bit provocative and worthy of note or further exploration. The news “problem” with the Gallup’s study may be in that it looks at religiosity through the lens of the life-cycle rather than then the “linear” secularization model that is the dominant “conventional wisdom” (…even as this has largely been discarded in the academic world in both theory and evidence. Comte, Durkheim, Weber, Marx, and Freud are all dead, yet religion lives on). Both Gallup and Pew reveal similar things about religion in the U.S. There is a large and growing number of Americans who are without any attachment to organized religion—although many are still personally religious or spiritual and believe in God. But there also remains a much larger group that is religiously affiliated. What about the future? Gallup has placed a bet on growth in religiosity given the demographic changes expected ahead. At the same time The New York Times and most other secular news organizations are fixated on perspectives about the demise of religion in America (…just follow the trail of headlines in the archives). Who will win that bet? Gallup is correct that life-cycle effects are important (even if they are largely unnoticed) and are being “stretched” by a growing “adultolesence” that has taken the rather typical dip in religiosity many American have always experienced in their teens and 20s into the 30s. One simple piece of evidence can be found in the age structure of Nones. Look in any recent decade and you’ll find that Nones are always disproportionally young—as if they are the “Lost Boys” never aging. Where are all the senior citizen Nones who had no affiliation in their 20s in the late-1960s? Adultolescence is only part of the puzzle. Religious affiliation is being affected in the same way that all kinds of membership organizations in America have been since the 1950s from PTOs to the Shriners. For Robert Putnam the primary cause for this membership decline was television (…Bowling Alone is one of the most important books I have ever read). People are not as likely to bowl in leagues anymore—even though bowling may be something they still enjoy. Similarly, there are many Americans who do not belong to a church anymore but who believe in God and consider themselves religious. Too many jump to the conclusion that a lack of affiliation means a lack of religiosity. The Gallup study is important in clarifying this common mistake. Just as Putnam highlighted the effects of TV (…still America’s #1 leisure time “activity” and growing by the year) I think we can now add in the hours we spend on iPhones, tablets, video games, Facebook, etc. to the demise of face to face participation in membership organizations (...on average, teenagers spend more than an hour and a half per day just texting... and a day is still only 24 hours!). We focus so much on the simple number of people who are not in churches on Sunday. Why don’t we ever study what they do instead? In CARA’s research we know many Catholics cite family obligations, work, illness, etc. It might be interesting to know how many are playing Assassin’s Creed instead of saying the Nicene Creed at Mass. We just don’t know. The Gallup study is betting that the 20-year-old without a religious affiliation playing video games on Sundays now will be in a church 35 years from now. As always I’m really only interested in where the data lead. This requires one to try to disentangle period, life-cycle, and generational effects. 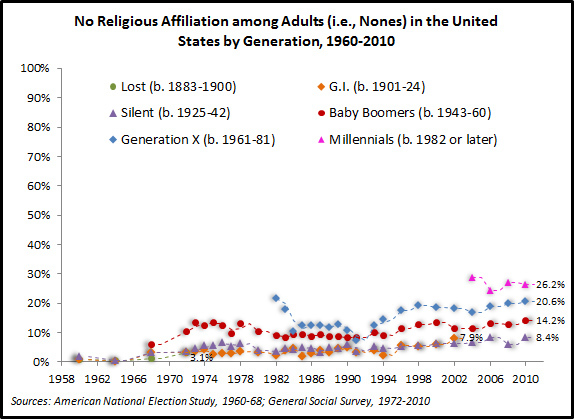 In the figure below we see the trends in lack of religious affiliation by generation. This was very uncommon among Americans born before 1942. It was never common among the Lost Generation (born 1883 to 1900) and the G.I. Generation (born 1901 to 1924). Yet this begins to tick up among the Silent Generation (born 1942 to 1960) in the 1990s. This of course is a pattern that the Gallup life-cycle model would not predict. With each successive generation from the Boomers (born 1943 to 1960) to the Millennials (born 1982 or later) there is significant growth in non-affiliation as if parents are increasingly unable to pass on their affiliation. This coincides with what Putnam’s “Bowling Alone” model would predict. The generations raised with a television in their living rooms are less likely to be connected to organized religion (…or other secular institutions). Those born in the digital age are even more disconnected from real-world membership institutions. 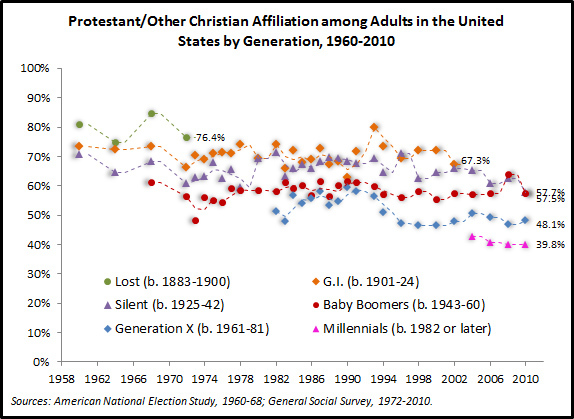 I don’t think the figure below leads one to be very confident that those playing video games on Sundays now will be praying in churches at mid-century when they are in their late 50s. As shown below, Protestant churches have felt the brunt of these changes. A majority of Baby Boomers self-identify as Protestant or Christian (excluding Orthodox Christians), yet only about four in ten Millennials identify as such. This is a reality that would be unrecognizable to the Lost Generation—the youth of a century prior who were 76% Protestant. 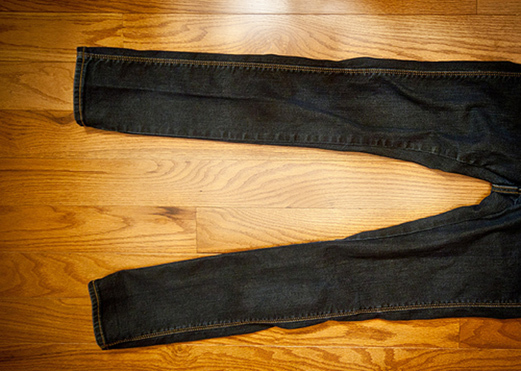 This is visible linear change. 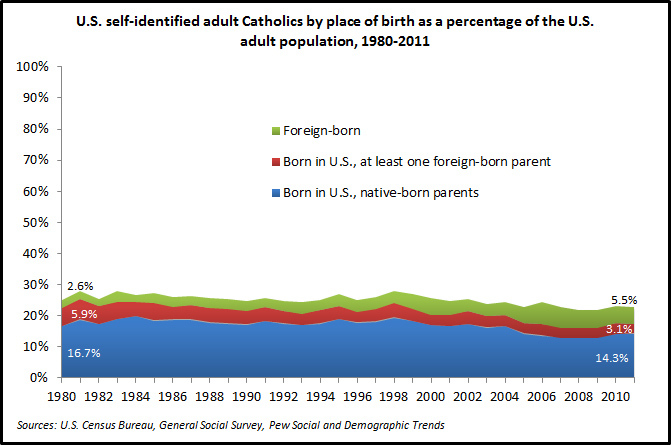 However, something quite different is occurring among U.S. Catholics. Here, there is remarkable stability across generations (even growth compared to the oldest generations). Some believe this pattern can be completely explained by immigration. 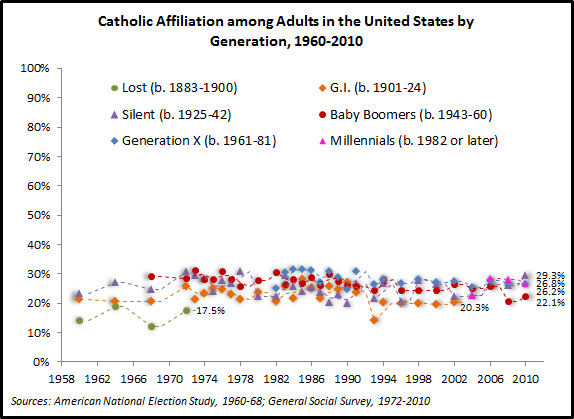 Yet as I’ve noted elsewhere the numbers for that argument just don’t add up as nicely as it is assumed and the reality we see in survey data shows a significant number of Catholics who may lose affiliation for a time returning later in life as the Gallup life-cycle model predicts. 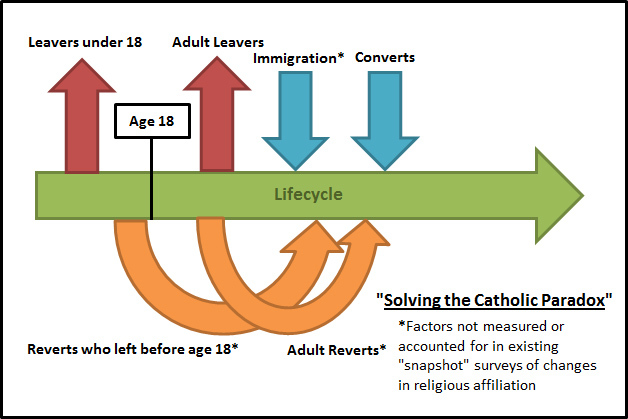 Immigration is important (as it has always been for Catholics in the U.S.), but the religious life-cycle may be as well. So I think Gallup may be partially correct in its predictions. 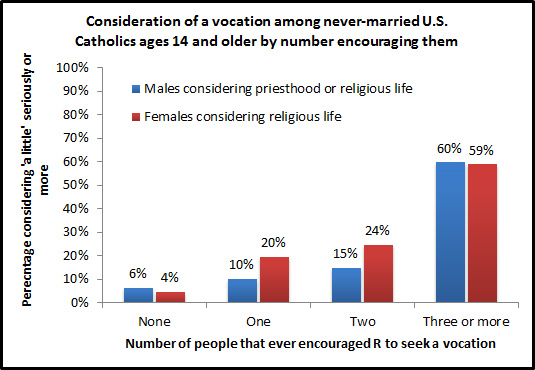 Catholicism seems to “stick” more than Protestant affiliations and this may be important in understanding the future of religious affiliation in the U.S. The Church has a higher retention rate of its youth than individual Protestant denominations and some who left revert back later in life (...the None retention rate is even lower. Not the “Lost Boys” after all...). 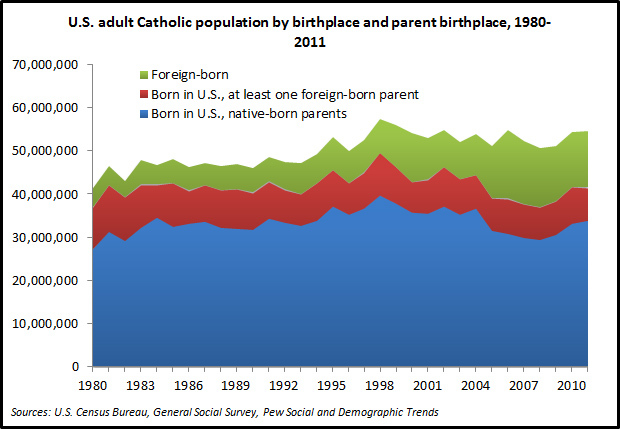 Immigration is expected to continue to be important as well even as some of this has been on the decline since 2007 (...and the Catholic population percentage has remained steady). I am less hesitant about making one prediction. I am 100% sure religion and God will still be alive and well in America, as Gallup argues, when The New York Times prints its final edition (1, 2, 3). Some institutions survive cultural changes better than others. Those who don’t see the changes coming probably weren’t paying attention to all of the relevant data. On the national level, the votes of U.S. Catholics are a bellwether—nearly always in line with the popular vote outcome—and this was the case again in 2012 (50% for President Obama and 48% for Gov. Romney). However, the national popular vote does not decide the presidency and instead we use the population-weighted popular votes of the states in the Electoral College system to determine the winner. 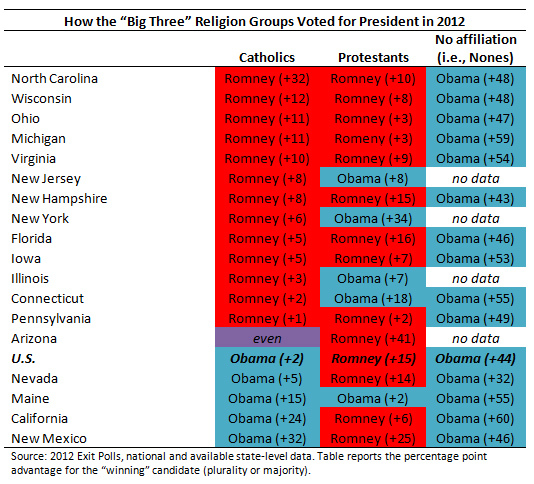 Although President Obama won more Catholic votes nationally than Gov. 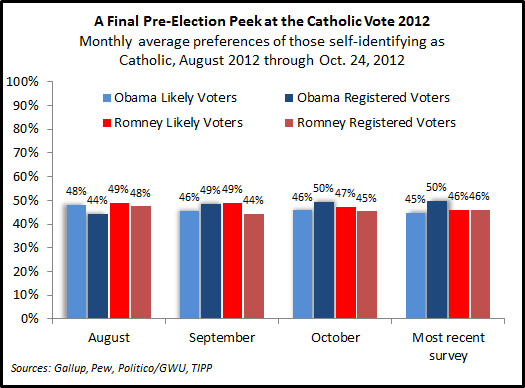 Romney, he would have lost badly in the states if the Catholic vote acted as a similar bellwether on that level. We can’t see what role religion played in each state because a religion question is not fielded in every state and this year some states did not even have an exit poll. But based on what we can see Mitt Romney would likely have preferred that the state-level Catholic vote would have been the bellwether rather than the national. 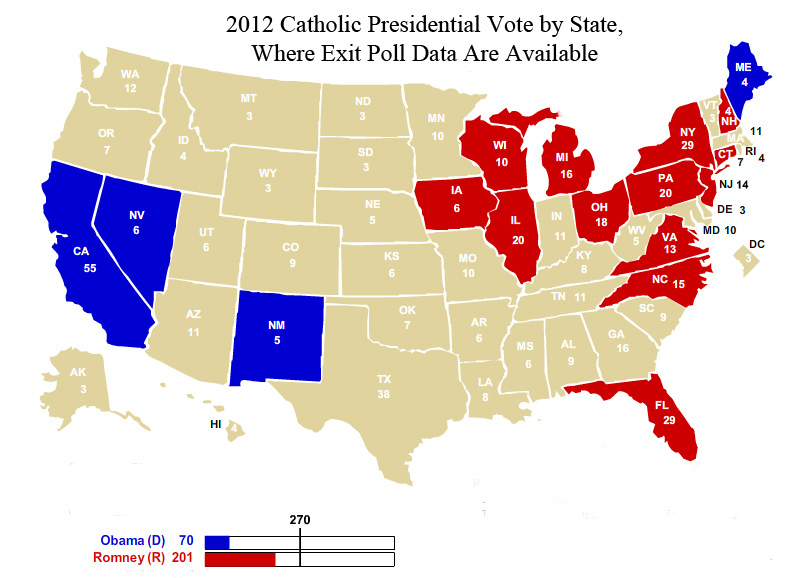 It is unlikely that President Obama won the Catholic vote in any Southern state and with what we can see above Romney would have been just 69 electoral votes shy of 270. 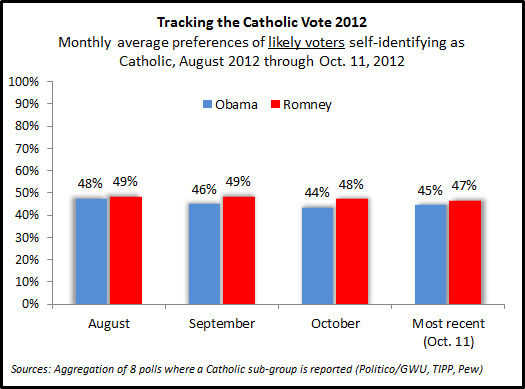 So how did the president get to 50% percent of the Catholic vote nationally? By winning this in California by +24 percentage points (62% to 38%). He also had big advantages in smaller states we can see like New Mexico (+32 percentage points) and Maine (+15). Romney won the Catholic vote in several Democratic states including Connecticut (+2), Illinois (+3), New York (+6), and New Jersey (+8) and led by strong margins in some of the Midwestern swing states including Michigan (+11), Ohio (+11), and Wisconsin (+12). There certainly is no consolation prize for winning the Catholic vote at the state level! But Mitt Romney can look back at his state by state performances in the primaries and later in the general election and see quite a bit of success among Catholic voters. Republicans of the future on the other hand need to be aware that winning the Catholic (and Protestant) vote in many states is no longer enough to win national elections. 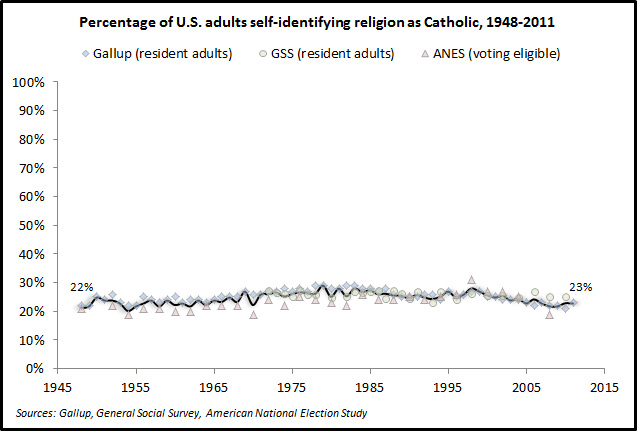 The “Nones” of 2012 are as important to the Democratic Party now as Catholics were to them in 1960 (pre-election, post-election). Santa Claus: To believe or not to believe? It’s seems odd how troubling Santa Claus has become. Among religious and non-religious alike there are those who second guess, for various reasons (e.g., secularism, commercialism, honesty), whether Santa should be “invited” over for Christmas in the 21st century. I can remember my two childhood confrontations with faith in Santa in the 1970s (before you could Google any doubts). I can’t remember the precise age but I can recall pushing my bed to a window overlooking another house. I tried to stay up until I saw him and his sleigh land on their roof. Without ready access to caffeine I failed. The next Christmas I set out a pen, paper, and inkpad with the milk and cookies and requested Santa’s autograph and a stamp of Rudolph’s hoof. It was my first real try at data collection. My handwriting analysis was inconclusive but I did know, even at that age, the difference between a beagle’s paw print and a reindeer’s hoof. But maybe Santa was in a hurry and my dog was nearby? (Others have had more success at collecting evidence). Santa is certainly no St. Nicholas and whether one is Christian or not there was a time not long ago when most American children believed in him. 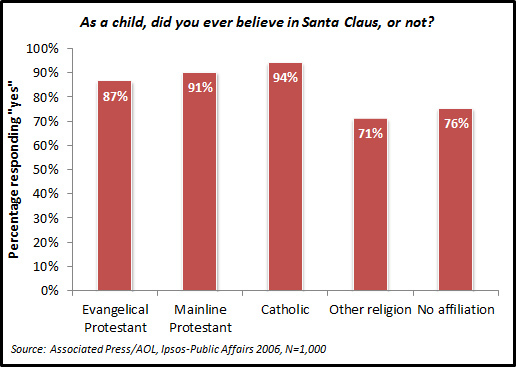 Eighty six percent of Americans in the most recent survey asking such a question (…that I can analyze) said they believed in Santa as a child. This is highest among Catholics at 94%. Even most non-Christians and the currently unaffiliated (…”Nones” who may have been religious earlier in life) say they believed in their youth. If you’re a parent you may be asking yourself does my child believe or are they just pretending to believe? If kids today are anything like we were in our youth they will likely begin to have doubts around age 10—the most frequently noted age for this. 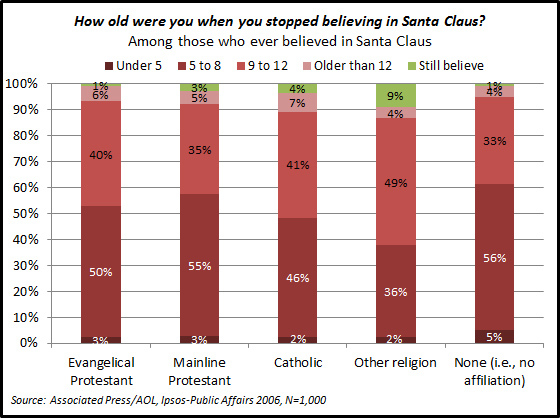 Nearly half of adult Catholics (48%) who believed in Santa say they stopped believing in the jolly old man before age 9. Overall, for American adults of all faiths, only about 2% of those raised to believe in Santa continue to believe in him as an adult (...comparatively speaking not a good “retention” rate). 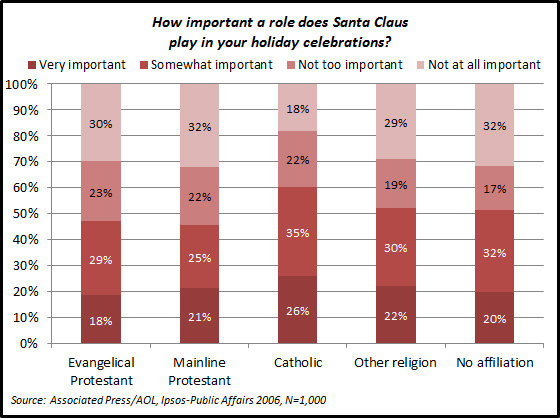 Even as very few believe as adults, six in ten Catholics (61 percent) say Santa Claus is still “somewhat” or “very” important to their holiday celebrations now as adults—more so than any other affiliation group. Minorities of Evangelical and Mainline Protestants say Santa is at least “somewhat” important to them this time of year. Some may find it surprising then that majorities of those who are of other religions or who have no affiliation say Santa is “somewhat” or “very” important to them. 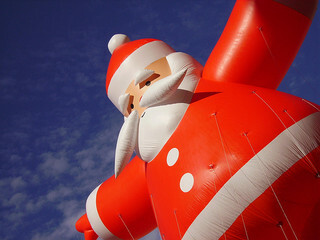 Is there an Evangelical Protestant “war” on Santa that I have been unaware of? 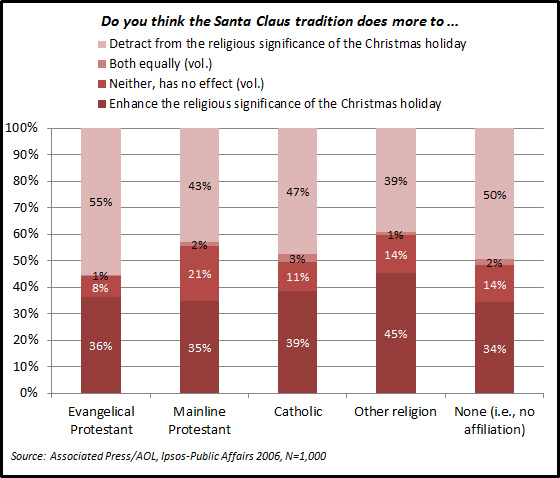 A majority of Evangelical Protestants (55%) also agreed that the Santa Claus tradition detracts from the religious significance of the Christmas holiday. Fewer Catholics (47%) and Mainline Protestants (43%) agreed that this is the case. 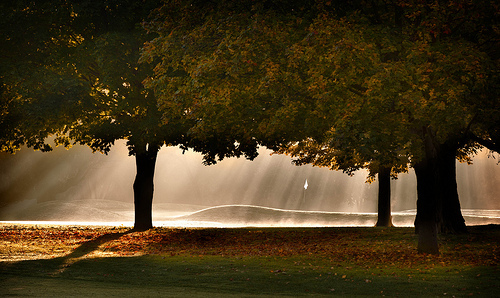 Photo above courtesy of Bart Fields from Flickr Commons. With election season over it’s time for the political science content on this blog to take a back seat for a bit (...until the 2014 midterms approach). In this final Election 2012 post I have to note some amusement with assumptions made about the U.S. political parties having set into “permanent” majority and minority statuses. Journalists and commentators have short memories. Political scientists know better. One of the best models for what we might expect in the future is in research conducted by two of my mentors Bernard Grofman and Thomas Brunell along with Samuel Merrill entitled, “Cycles in American National Electoral Politics, 1854-2006.” American politics is rarely, if ever, linear in its evolution. There are no “locks” on anything (…following 1960 and 1964 one could have easily predicted that Catholics would overwhelmingly vote Democrat in the future but reality didn’t pan out that way) and the parties have quite a knack for reinvention (...see any review of the history of the Democratic Party and you’ll know what I mean). In recent years, Americans have tended to favor divided government and it is uncommon for them to let one party control the presidency for more than two consecutive terms. 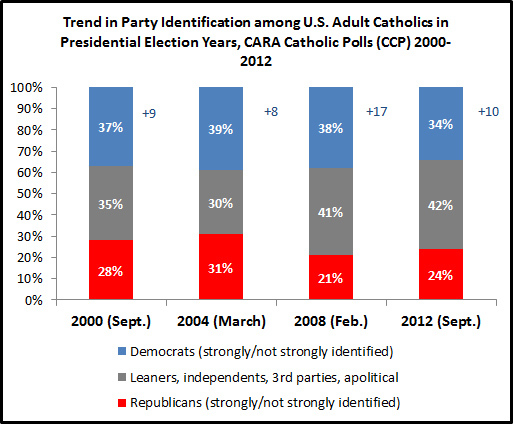 Despite some of the post-election rhetoric, the 2012 election cycle did not realign the U.S. party system generally or for Catholics more specifically. 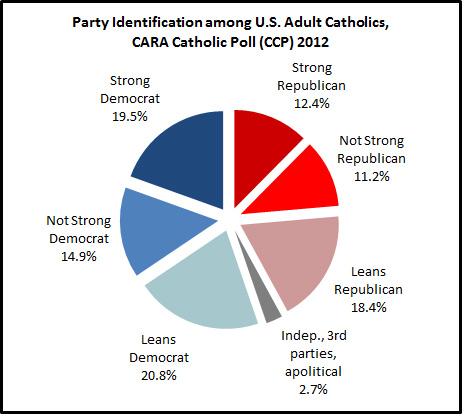 The figure below shows party identification of U.S. adult Catholics (i.e., the voting age population) in CARA Catholic Polls (CCP) fielded closest to a presidential election since 2000. The 2012 election represents a bit of a regression to the mean with the Democratic Party affiliation advantage over Republicans dropping 7 percentage points from +17 in 2008 to +10 percentage points, which is more consistent with 2000 and 2004. The Washington Post has a figure on how this same regression to the mean occurred among many sub-groups of voters in 2012 compared to 2008. Even factoring in party “leaners” does not significantly alter the overall Catholic partisan balance (...leaners are the most volatile group and often shift between parties or independent stances as issues and candidates change). Why am I amused by the notion of “permanent” majorities being set in 2012? Because things could change quickly. Looking ahead, the 2014 election will be a decidedly lower turnout contest without the presidency on the ticket. 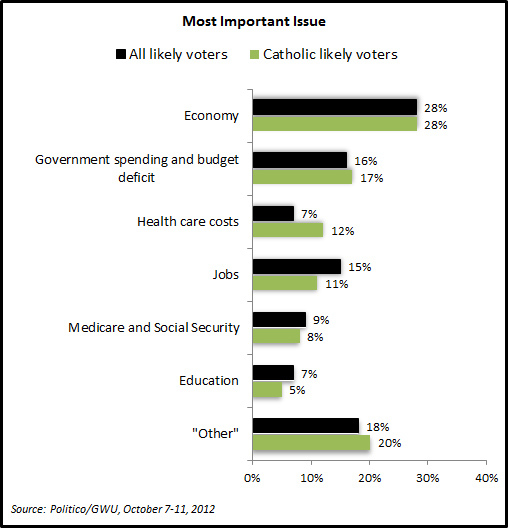 This may favor Republicans again as it did in 2010 among the overall electorate and Catholic voters. Currently, Democrats have long odds on regaining the House (although this could change depending on how the “fiscal cliff” is resolved). The Republicans may even have a better than fair chance to make significant gains in the Senate given the distribution of races and recent electoral history accounting for the party of the incumbent president. If I were Sen. Harry Reid I would really think twice about weakening of the filibuster. He may need it. Republicans are also likely to have more favorable odds in 2016 than they did in 2012 without having to face an incumbent (...one of the reasons many Republicans sat on the bench during the 2012 primary season). Second terms can be a mine field. The president’s popular vote total and percentage declined from 2008 and his approval ratings are on a rather typical long-term downward trajectory that has been experienced by most post-World War II presidents (...even his post-election polls have shown a worse than average “bounce” in approval). This all comes at a time when presidents have traditionally started thinking about their legacy. Historians and political scientists will pay close attention to unemployment and poverty rates, deficits and debt, as well as economic growth during his two terms. President Obama will also inevitably be compared to both Clinton and Reagan who were able to overcome and/or work with opposition from Congress. The resolution of the current taxes, budget, and deficit stalemate in Congress will be important not only for the perception of his effectiveness but also for its eventual policy outcomes. Will the economy improve, jobs grow, and the deficit be reduced? Those thinking of running for president as a Democrat in 2016 have their fingers crossed. On the other side of the aisle I think the Republicans find themselves in a similar position to the Democrats in 2004. Following that loss, Democrat strategists Stanley Greenberg and Matt Hogan produced a paper entitled “Reclaiming the White Catholic Vote” as a road map to winning the presidency again. I would not doubt if somewhere Republican strategists were working on a similar type of paper now perhaps entitled “Making Gains among the Hispanic Catholic Vote.” Republicans already do well among Hispanic Evangelicals but would likely be unsuccessful in convincing Hispanic “Nones” to switch parties or votes. 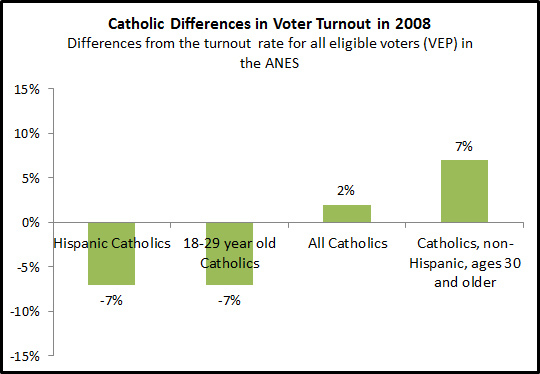 Catholics may represent their best chance at convincing more Hispanic voters to consider choosing a Republican in 2016. Yet, winning a sub-group of the Catholic vote for Republicans in a higher turnout presidential election is often like sailing into a headwind. 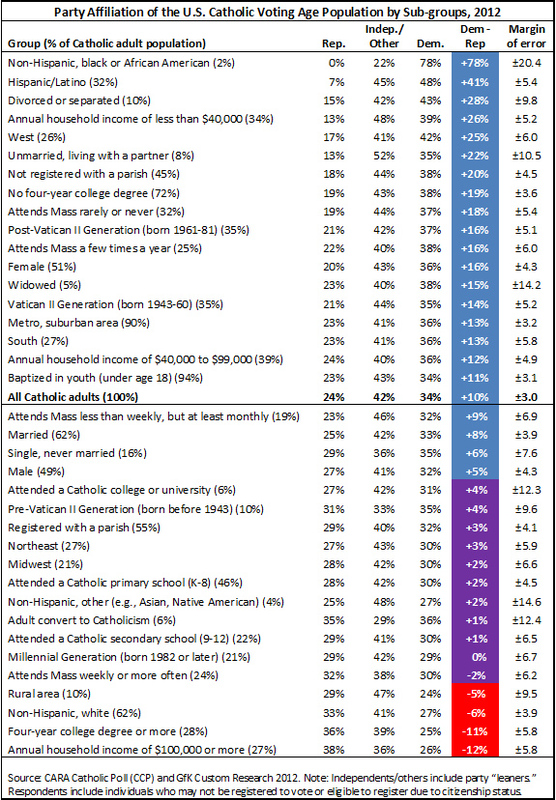 As you can see in the table below, most sub-groups affiliate with or lean toward the Democrats with the exception of Catholics in rural areas, non-Hispanic whites, those with a college degree, those with an annual household income of $100,000 or more, and weekly Mass attenders. Republicans would not need to win the votes of Hispanic Catholics outright, but gaining more votes from this sub-group would improve their odds—especially if these gains were made in key battleground states. Democrats have one huge unknown on their side. Will Hillary Clinton run in 2016? If she does, I think the odds for Republicans become decidedly worse. Catholic Democrats often favored her over the then Sen. Obama in the 2008 primaries. Regardless of what either party does in the next four years I expect the vote of Catholics to continue to be divided and a bellwether for the larger electorate. 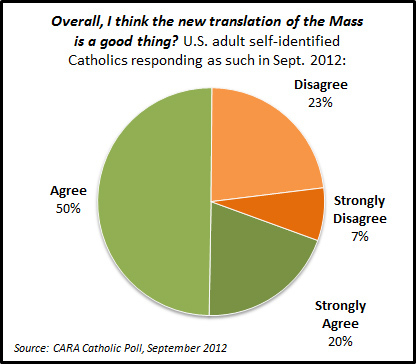 In September 2012, nearly a year after the changes took effect, seven in ten U.S. adult self-identified Catholics agree that the new translation of the Mass is a good thing (with 20 percent agreeing “strongly”). Nearly a quarter “disagree” (23 percent) and 7 percent “strongly” disagree with this statement. 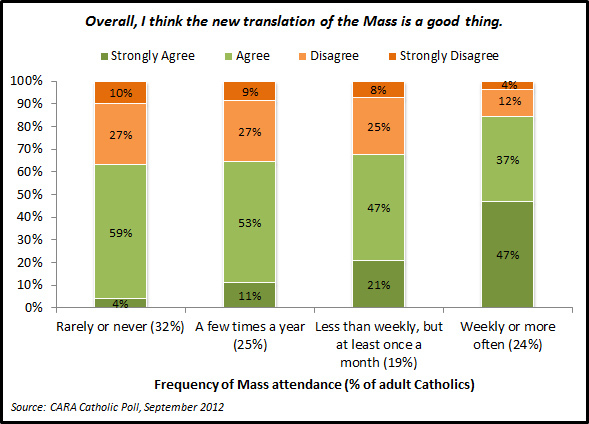 Catholics who attend Mass weekly are among the most likely to agree that the new translation of the Mass is a good thing. Eighty-four percent responded as such (47 percent “strongly” agree with this statement). By comparison, 63 percent of those who rarely or never attend Mass agree with this statement (only 4 percent “strongly” agree). 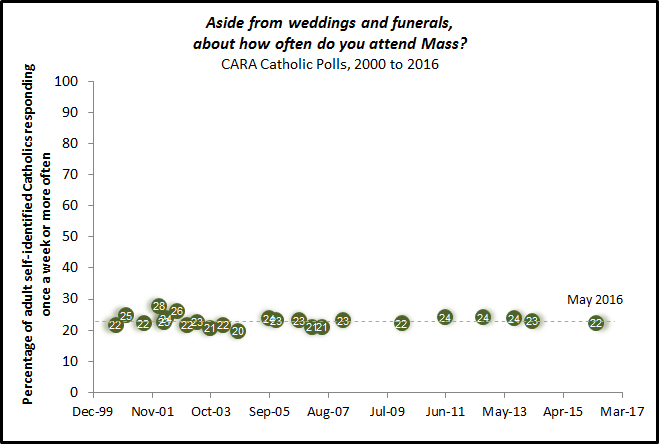 Regular Mass attendance levels remained the same in the 2012 survey compared to 2011 with both polls estimating that about a quarter of adult Catholics (24 percent) attend Mass weekly or more often (weekly Mass attendance levels of have been steady since 2000). However, there was a slight decline in the total percentage of Catholics saying they attend Mass monthly (i.e., once a month or a few times a month) from 25 percent in 2011 to 19 percent in 2012. However, this difference is just within the surveys’ margins of sampling error and thus may be due to random variations between two samples. CARA will continue to track Mass attendance in its polls to see if a new pattern is emerging. 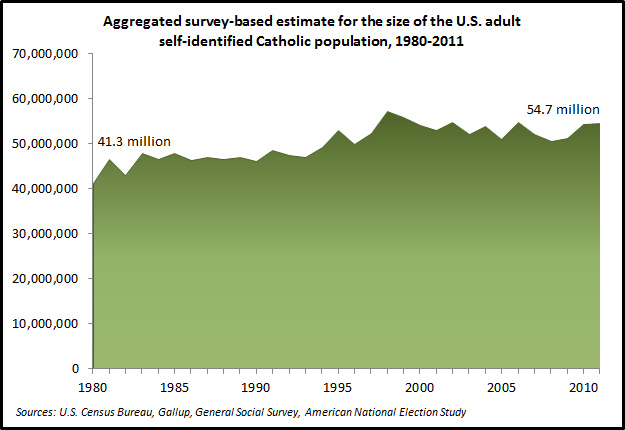 It is also the case that there have been no statistically significant changes in the numbers of Americans who self-identify as Catholic in the last year either. Thus, there was no identifiable exodus from the Church that could be related to the changes in the liturgy. 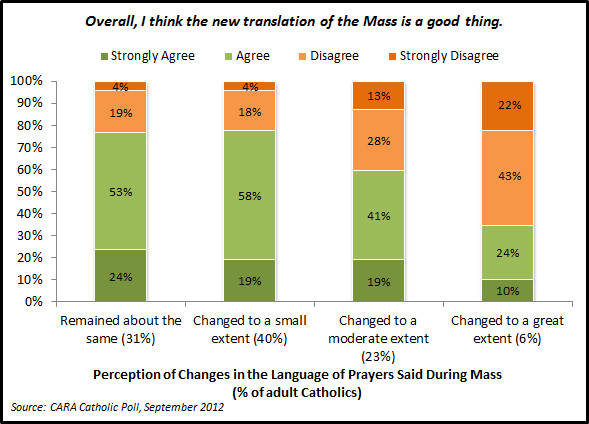 Respondents in the 2012 poll were asked, “During an average Mass, would you say that you have noticed that the language of the prayers that are said during Mass have (1) remained about the same, (2) changed to a small extent, (3) changed to a moderate extent, or (4) changed to a great extent?” Four in ten respondents (40 percent) said they had noticed the language of these prayers had changed to a small extent and 23 percent said these had changed to a moderate extent. Only 6 percent said they noticed changes to a great extent and 31 percent said that the language of these prayers had remained about the same as far as they noticed. Those who have perceived less change are those most likely to agree that the new translation is a good thing. Among those who feel the language was changed “to a great extent,” a majority disagree that the new translation is a good thing (65 percent). However, this group makes up only a small number of respondents (6 percent). A series of agree or disagree questions were asked of respondents in both the 2011 and 2012 surveys. These are compared in the table below which shows the 2012 results and the percentage point change in agreement from 2011. Respondents were less likely to agree with all statements in 2012 than in the 2011 survey. However, in most cases, the differences between the surveys is within the margin of sampling error. In one instance, respondents are discernibly less likely to agree at least “somewhat” with the statement: “The words of the prayers recited by the priest and people make it easier for me to participate in the Mass” (79 percent in 2012 compared to 86 percent in 2011). This shift may represent the learning curve some Catholics have experienced with the revisions. 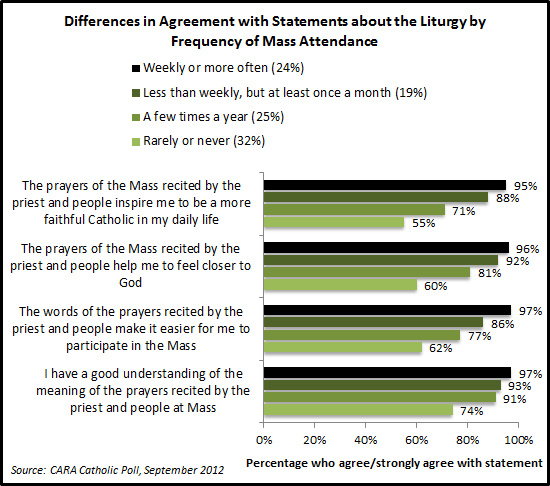 Catholics who attend Mass more frequently are more likely to agree with all four of the statements regarding the Mass in 2012. 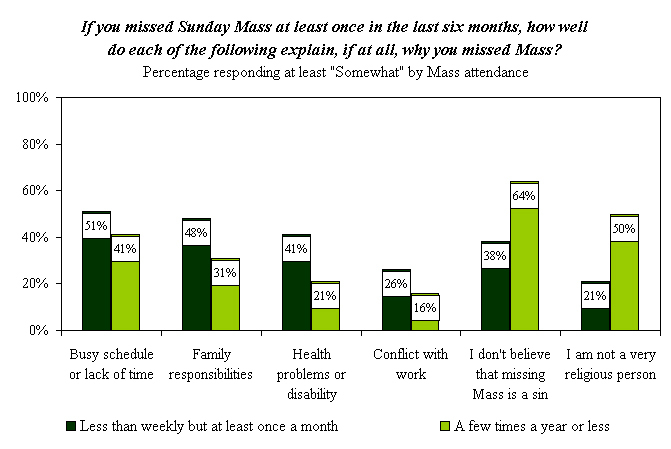 It is also the case that among weekly Mass attenders there are no significant differences in responses to these questions between 2012 and 2011. If there is one note of caution for the future in the data it is in generational differences. 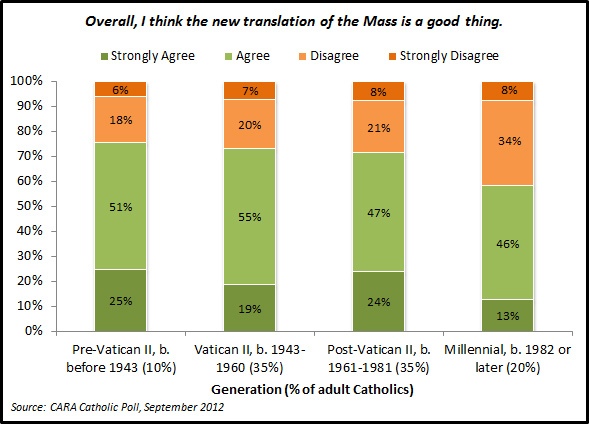 As shown in the figure below, Millennials (adults born after 1981) are more likely than older Catholics to “disagree” that the new translation is a good thing and less likely to “strongly” agree with that statement. These differences are beyond margin of sampling error. At the same time it is also the case that significant majorities in each generation agree with that the translation is a good thing. The 2012 survey was completed by 1,047 self-identified Catholics who were 18 years of age or older resulting in an overall sampling margin of error of ±3.0 percentage points. Sixty-seven percent of the GfK Custom Research (formerly Knowledge Networks) panel members invited to take the survey completed it. The survey was in the field from September 10 to September 18, 2012. 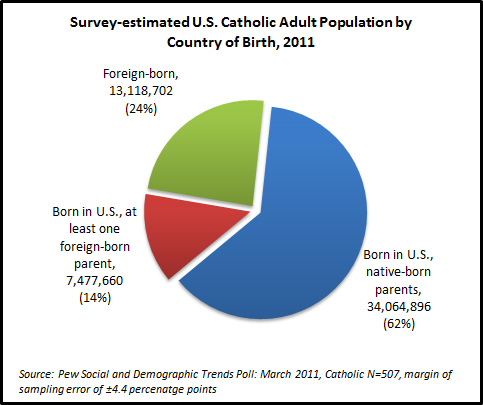 The 2011 survey included 1,239 self-identified Catholics who were 18 years of age or older resulting in a sampling margin of error of ±2.8 percentage points. Fifty-seven percent of the Knowledge Networks panel members invited to take the survey completed it. …On an unrelated note I apologize for having been on a mini-sabbatical from the blog of late with work, travel, and even a bit of vacation. I spent Election Day in Disneyland, which I hear may have been more of a “real” experience than watching what could be seen on MSNBC or Fox News that evening (...or thereafter)! Glad to see some voices recently calling out these networks for what they are (Wash Post, Huff Post, NY Times). 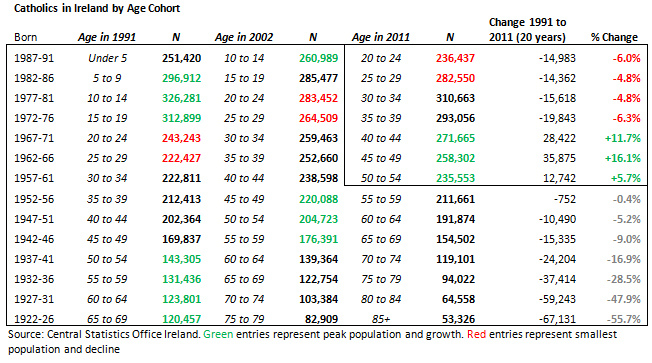 I'll have more analysis of the changing Catholic electorate and a bunch of new CARA data on other topics to post here so be warned that the blog may take on a bit of an Advent calendar quality in the days ahead.